A native of Guinea, West Africa, Naby grew up dancing. He traveled and performed with Les Ballets Merveilles for many years before coming to America. He has taught and continues to teach all over the country. 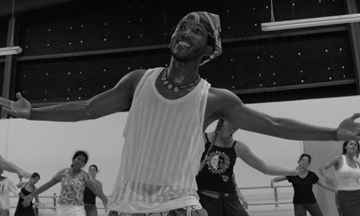 Currently he teaches West African Guinean dance at San Francisco’s prestigious ODC dance studio as well as other reputable Bay Area dance studios. Naby’s dynamic skills and soaring spirit have established his dance class as a high energy experience that has long been a tradition at Kosmos Camp. There is live West African drumming that accompanies Naby’s dance class. His authentic presence and dynamic teaching style convey the spirit of his culture with skill, inspiration, and joy! You will experience the traditional rhythms, dances, and songs of Guinea. You will also explore Guinean culture through West-African rhythms. Some of the rhythms/ dances we will explore are used for weddings, baby naming ceremonies, and circumcision rituals. The class begins with a warm-up, followed with across the floor choreography and concludes with an improvisational dance circle.